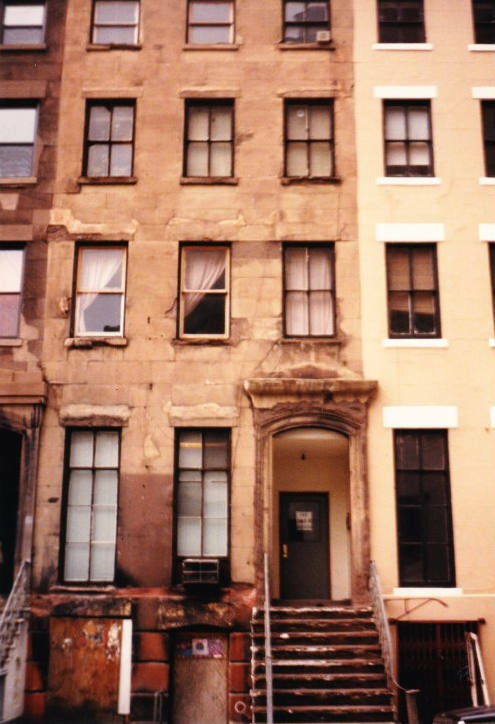 In 1984, I visited a number of literary sites in New York City, one of those being the building at 149 W. 21st Street, where Lucien Carr lived from 1950-1951. Credited with introducing Jack Kerouac, Allen Ginsberg, and William Burroughs to each other, Carr was a key member of the original circle of the Beat Generation. After Kerouac finished the first draft of On the Road in April 1951, he moved briefly into Carr’s apartment, where he wrote a second draft on a roll of United Press teleprinter paper before transferring it to individual pages. That scroll still exists—all but the end, eaten by Carr’s dog, Patchkee.